ALAMEDA, CALIFORNIA – The Oakland Raiders officially eliminated from playoffs contention in 30-20 loss to the Green Bay Packers. Derek Carr threw a pair of interceptions in the first quarter to put Oakland in an early 0-14 hole. The second year quarterback fought through the adversity in the first half and the Raiders only trailed by one point 13-14 headed into half-time. Carr responded with a pair of touchdowns to rookie wide receiver Amari Cooper. “It hurts. It hurt my heart to be honest because I know how much work I put into this, how much work our team puts into this, our coaches,” Carr said. “I know the sacrifice during the week and even during the offseason. Everyone’s ultimate goal is to go to the playoffs and win the Super Bowl. That’s always my goal, that will never change. Despite the Packers 14-0 Green Bay fell behind 20-17 midway through the third quarter on Carr’s second touchdown pass to Cooper. The Raiders lead was short-lived as Jeff Janis returned the ensuing kickoff to the 47. Three plays later, former Raider and San Jose native James Jones scored a 30-yard touchdown on busted coverage in Oaklands’ secondary. Rodgers engineered a 19-play field goal drive on Green Bay’s next possession and Mason Crosby’s third field goal made it 30-20 with 4:25 left to put the Packers in control. 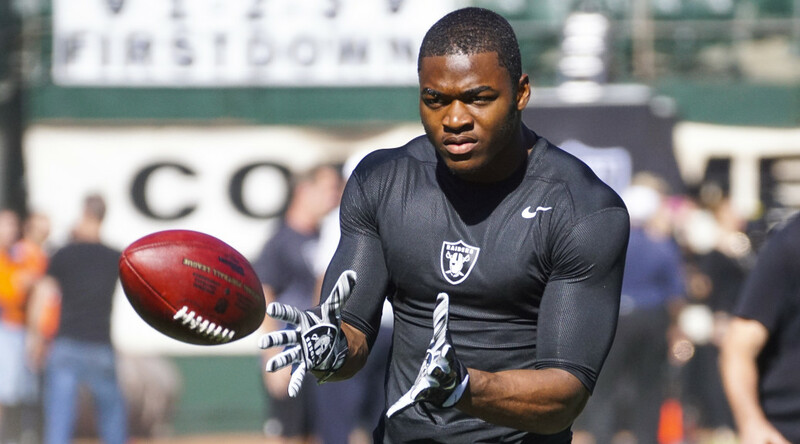 The highlight for the Raiders was rookie Amari Cooper. He caught six passes for 120 yards on Sunday. He reached the 1,000-yard mark on a 41-yard grab in the third quarter, becoming the first Oakland player with 1,000 yards receiving since Randy Moss in 2005. That was the longest current drought in the NFL. He also added two more touchdowns. He now holds a Raiders franchise rookie record with six touchdowns. The rest of the accolades went to the Packers, who got 2.5 sacks from Julius Peppers to win their third straight game. Carr threw two interceptions in the first quarter to set up Green Bay touchdowns. Hyde’s interception set up the Packers at the 18, and John Kuhn ran it in from the 5 for the first score. Carr’s next pass was high to Seth Roberts and Randall returned it 43 yards for a touchdown that made it 14-0. The Raiders rallied with a pair of field goals in the second quarter, but the Packers still looked to be in control as they drove into scoring range late in the half. But Benson Mayowa forced and recovered a fumble by James Starks at the Oakland 21 with 1:22 to go and Carr connected on a 19-yard TD pass to Cooper four plays later to make it 14-13 at the half. Packers LB Jayrone Elliott (quadriceps) and OL David Bakhtiari (ankle) left with injuries. … Raiders DE Mario Edwards Jr. left after the first drive with a neck injury and WR Seth Roberts (abdominal) also was injured.